Phakeys Pharmacy have recently launched a new website to coincide with New Premises. Phakeys Pharmacy in Nottingham have recently used the launch of there new website to showcase the expanded services and instore facilities, made available due to a Pharmacy relocation. 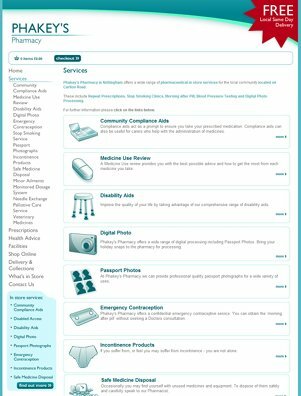 Using the Community Pharmacy Package as the basis to create a website the team at Phakeys Pharmacy added an additional eight in store services which was made easy by the pre-written service content we provided. In addition to the services the team wanted to showcase the new facilities by adding instore photos and details about ease of access to the eldery and disabled. It was also important to get the new address out there we created bepoke graphics to promote the move and provided additional graphics for the team to update.